When she’s not working in the lab, Shannon loves spending time with her family. On the weekends, Shannon can often be found at soccer games, swim meets, and other activities cheering on her four kids. Gardening is also one of her favorite hobbies, and she has been cultivating a wonderful assortment of flowers. 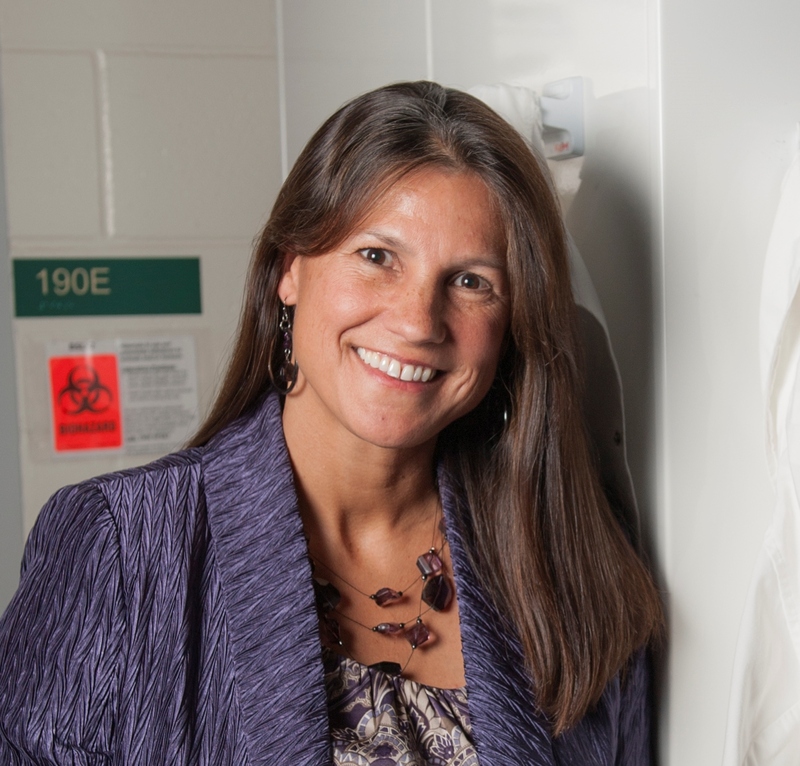 The goal of Shannon’s research is to understand how pathogens (bacteria or viruses) cause disease in people. How likely a person is to get sick may be due to the different types of pathogens they are exposed to, but also genetic variation within a specific type of pathogen. Not every bacteria of a particular species is exactly identical, and some are more effective at attaching to targets and infecting hosts. Shannon has always loved science, but as an undergraduate student, she had an opportunity to work as a research assistant in a lab studying bacterial evolution. This hands-on experience taught her a lot about bacteria, and she realized this field was something she was interested in pursuing as a career. The beginning of Shannon’s independent academic research career was challenging. She interviewed for faculty positions at several institutions and was disappointed to receive negative feedback that she wasn’t a good fit for jobs she really wanted. Despite having doubts about whether she could make it in academic science, Shannon persevered. She incorporated the feedback she was given to improve how she presented herself, her experiences, and her research program, and she was ultimately rewarded with an excellent job offer. Recently, Shannon received the National Postdoctoral Association Mentorship Award. It meant a great deal to Shannon that the three postdoctoral researchers in her lab took the time to nominate her, and they wrote wonderful letters of support. Shannon had no idea she was being nominated, so she was surprised and excited to receive the notification that she had been selected. A few years ago, Shannon traveled to Amsterdam to present at a scientific conference. Over 500 people attended her lecture, and it was the first time she ever presented to such a large audience. Shannon was nervous, but it was a great experience that gave her confidence going into future talks. It was also wonderful to meet and learn from well-known researchers in the field whose research she had been following for years. While there, Shannon was able to explore the outdoor market in Amsterdam, and she enjoyed taking it all in while strolling down the city streets. In Shannon’s lab, celebrating birthdays is an important way to bring lab members together. One of her graduate students makes phenomenal cupcakes that are often a celebration staple. Regardless of whether they are indulging in custom cupcakes or a quick store-bought cake, it is fun for everyone to gather in Shannon’s office, awkwardly sing happy birthday, and hang out together. You have to believe in yourself and you should do what you love. There are always going to be challenges and disappointments on the path to success. Just work hard and do what you believe in, and you’ll make it to your goals. Shannon’s current research focuses on the molecular epidemiology and evolutionary genetics of bacterial pathogens including diarrheagenic E. coli and group B Streptococcus, a leading cause of bloodstream infections and meningitis in newborns. She is particularly interested in determining how genetic variation contributes to differences in clinical outcomes. Since 1998, she has contributed to over 65 publications and book chapters, and some of her recent work has been featured on Michigan Radio, WKAR, and in multiple news sources. She currently serves as an ad hoc reviewer for the National Institutes of Health and as the primary mentor for seven undergraduate researchers, six graduate students, three postdoctoral fellows, and three research assistants.